A look at past, present, and future efforts to control flooding in the Don Valley. Bayview Avenue flooded in the Don Valley. Photo by Vik Pahwa from the Torontoist Flickr Pool. 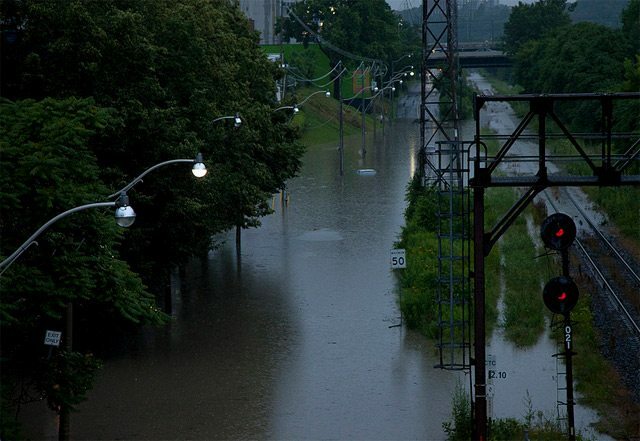 From cars marooned on the Don Valley Parkway to passengers stranded on a GO train near Bayview Avenue and Pottery Road, Monday night’s storm reminded Torontonians of the Don Valley’s susceptibility to flooding. Enacting preventative measures for sudden onslaughts of water along the Don River has a mixed track record, though a few projects offer hope for the future. Since the mid-19th century Torontonians have dealt with flooding along the Don and its branches. During that time period, ice jams and spring thaws overflowed onto the river’s flood plain, making businesses and residents along it miserable. Adding rainfall to either of those conditions had a way of aggravating these problems. Take the flood that occurred on February 25, 1918. Following a heavy thunderstorm, a strong gale sent water and ice spilling over the Don’s banks. The Canadian Northern Railway yards were quickly buried under three feet of water. “Hundreds of freight cars are standing in the flood,” the Star reported the following day, “in most cases submerged only up to the floor, but in a number of cases fully half underwater.” Employees caught in the flood spent the night in stranded passenger cars before being rescued. 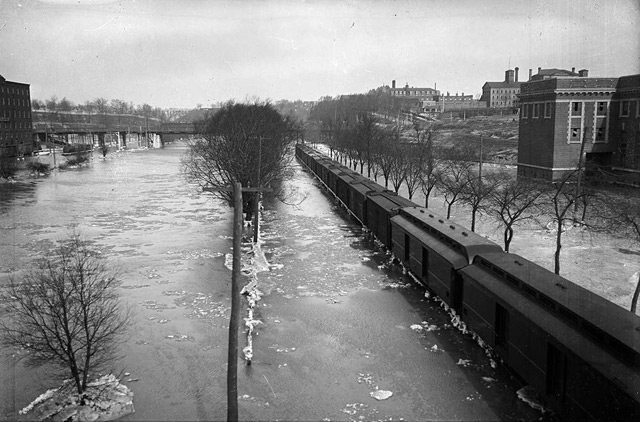 Flooding along the Don River, north of the Wilton Avenue Bridge (present-day Dundas Street), February 26, 1918. City of Toronto Archives, Fonds 1231, Item 32. Flooding wasn’t helped by the drainage of the marsh at the bottom of the river during the early 20th century to create the Port Lands. The rerouting of the river through the Keating Channel didn’t account for the volume of silt deposits flowing down the Don. As the silt was no longer easily absorbed into the harbour, annual dredging was required to maintain a proper depth for shipping vessels. The practice continued until 1974, when concerns from environmentalists about dumping toxic sludge in the lake brought it to a halt. Despite the periodic floods, little thought was given to methods of mitigating their effect apart from hoping rebuilt structures could withstand them. Not until the fatal fury of Hurricane Hazel in 1954 were flood control measures seriously considered. In 1959, the Metropolitan Toronto and Region Conservation Authority (MTRCA) produced a plan calling for the acquisition of flood plains, improvements to river channels, the creation of a flood warning system, and the construction of a series of dams and reservoirs across Metro Toronto. Under the plan, the Don and its branches would receive four dams, two of which could be used to create recreational lakes. G. Ross Lord Dam, after 1966. City of Toronto Archives, Fonds 217, Series 249, File 20. The plan was never fully realized because of cost and political squabbling. Along the Don, only the Finch Dam, soon renamed after MTRCA chair G. Ross Lord, was built. Scheduled to be built during the 1970s, work began in 1965 to protect construction on the Ontario Science Centre, downstream. 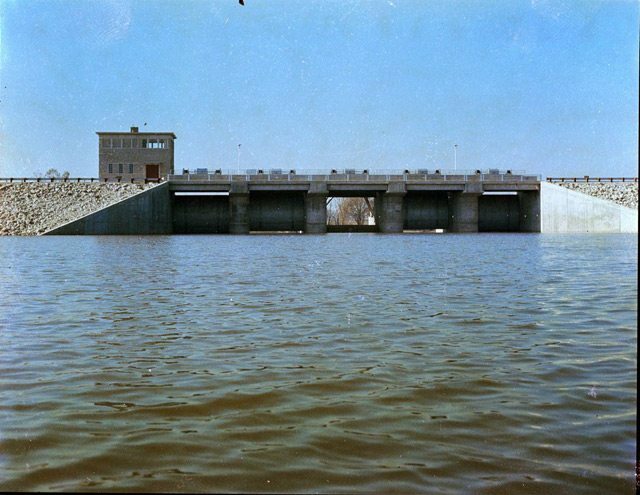 As the dam neared completion in 1973, MTRCA officials admitted that while deaths would be reduced, the structure wouldn’t prevent flooding if a Hazel-type storm hit. A decade of fighting over resuming dredging of the Keating Channel exploded in 1986 when three floods closed the Don Valley Parkway, a road intended to sit above the maximum flood line. Mayor Art Eggleton demanded swift action from the province to revive dredging. The MTRCA soon received final approval for a four-year clear-out of 400,000 cubic metres of sludge. Around that time, the City expropriated the future West Don Lands for development. Then known as Ataratiri, the plan included a dyke for flood protection. When the project was cancelled in 1992, the MTRCA withheld approval for nearby developments without adequate flood-proofing. When the development plans for the West Don Lands were revived in the 21st century, designs and environmental assessments accounted for flood control. In 2007, construction crews started work on an 8.5-metre berm, to be integrated into Corktown Common park. Sketch of the proposed naturalization of the mouth of the Don River, designed by Michael Van Valkenburgh Associates, Inc. Image courtesy of Waterfront Toronto. While the berm is ready to go, other flood control projects along the Don remain in development. One project stemming from the Wet Weather Flow Master Plan adopted by City Council in 2003 is an effort to upgrade the Don Sanitary Trunk Sewer system to reduce the amount of sewage and other nasty stuff dumped into the river during major storms. Though a staff report was approved by council in September 2011, the project awaits approval from the provincial Ministry of the Environment. The age-old problem of the Keating Channel is to be fixed by naturalization of the mouth of the Don. 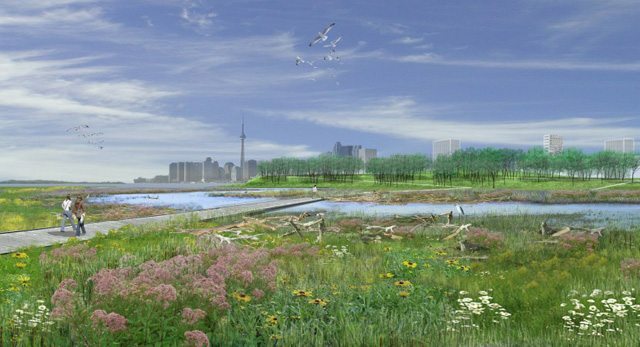 The naturalization is supposed to tie in with Waterfront Toronto’s plans for the Port Lands, which are now being amended in the aftermath of 2011’s political turmoil over the future of the district. Additional material from HTO: Toronto’s Water from Lake Iroquois to Lost Rovers to Low-flow Toilets, Wayne Reeves and Christine Palassio, editors (Toronto: Coach House Press, 2008), the February 5, 1960, June 17, 1965, May 10, 1973, and June 29, 2013 editions of the Globe and Mail, and the February 26, 1918, September 16, 1986, and March 18, 1992 editions of the Toronto Star.